If we don’t laugh, we’ll cry. If any expression captures the exasperation and desperation of the last year-plus-however-many-months for many of us, this is it. Current events under this administration are so absurd that it makes sense that comedy is better than ever. There is a lot of material to work with when the leader of your nation is a ridiculous (and probably senile) man. But comedy also needs to be better than ever: humor is one of the most powerful weapons in the fight against fascism. It makes leaders farcical, and, in doing so, makes them defeatable as well. It is the hope we can hold on to. 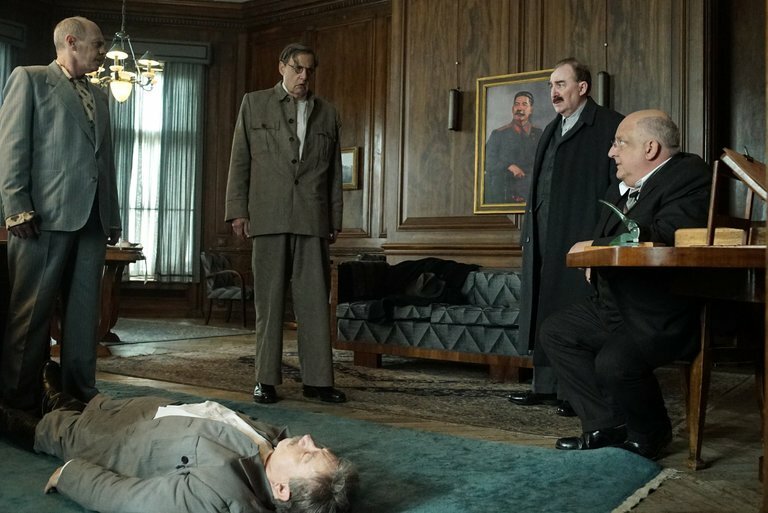 Armando Iannucci’s latest brilliant satire, The Death of Stalin, is not just about Stalin’s death and the struggle for power among the sycophantic members of his Central Committee. Where there is laughter–and Iannucci gives us plenty to laugh about–there is tension. This film reflects a tension between the horrible tragedies of Soviet Russia under Stalin, the millions put to death because of his paranoia, and our fear that the Cult of Personality is very far from being history. Iannucci makes leaders look like fools. Dinner with Stalin and his cronies becomes a scene rife with humor– fart jokes and discussion of summer camp pranks, like dipping someone’s hand in water to make him pee himself. When Central Committee members flock to Stalin’s collapsed body, they all incidentally kneel in a carpet soaked with the nearly-dead leader’s urine. Their bumbling is not solely physical. They jockey for power trips: whose car leads the procession, whose consolation of Stalin’s daughter Svetlana is most poetic. This makes all of them appear both dangerously human and dangerously incompetent. They are people who are capable of peeing themselves. They are also power-obsessed children. Though incapable and idiotic, one of them will have power; one of them will decide the fate of a nation. Or, rather, one of them will have the power to determine what the next set of arbitrary rules will be. Stalin’s regime was based on capricious and paranoid moods. We see Khrushchev (played by Steve Buscemi), after the aforementioned dinner, dictate to his wife what jokes killed and what jokes flopped. Though a ridiculous account to keep, it is also a testament to how easily someone could be on the outs, and to be on Stalin’s bad side meant death. Jokes become a life or death matter. In Stalin’s absence, there is a struggle to figure out what the new rules are, because there was literally no foundation beyond the leader’s immediate mood. The Soviet Union was run arbitrarily. The absence of logic and reason in the running of a country is both chilling and familiar. It is hard not to draw parallels between what we see in The Death of Stalin and what we see in the headlines. It’s hard not to think about the rotating cast of sycophants serving in this current administration and the arbitrariness with which they are selected and disposed of. It’s hard not to laugh at the image of Rex Tillerson sitting on the toilet, reading the tweet that informed him he was fired as Secretary of State. It is hard to take this president seriously, but we must. At the end of the film, Khrushchev delivers the poignant line, “This is how people get killed, when their stories don’t fit.” In a cult of personality, in a burgeoning fascist state when media is increasingly unreliable, we have to remember what the story is. Today in Russia, monuments dedicated to Stalin are being erected; the majority of citizens still believe in him as a great and powerful leader. That is the story being told, rather than the one of Stalin as a genocidal maniac. Satire can do us a lot of good–it maintains the mortality of powerful men and reminds us of their nonsensical natures. But, all the while, we have to be vigilant of the stories being told. We have to remember that beneath The Death of Stalin there is a texture of fear and uncertainty. We have to remember that power is real, and is often a matter of life or death.